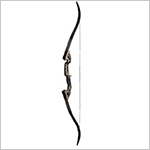 Best recurve bows (top 10 chart) – divided by price range. Bear is considered the pioneer of modern archery bows. Most of the recurve bows they make are a bit expensive, but you definitely get your money’s worth when you buy them. An example of their flag-ship product is the Bear® Grizzly which is one of the finest recurves you can get on the market. Martin was created over 60 years ago in 1951 by a group of passionate Archers – the Martin family. Gail Martin, one of the co-founders, was inducted into the prestigious Hall of Fame of Archery. Their business has always been international and their recurve bows are available in dozens of different countries. The company purchased another bow manufacturer, Damon Howatt Archery, in 1976, which allowed them to expand their traditional bow line of products. Among their most popular recurve bows are the Martin Jaguar as well as the Martin Saber – both of them extremely popular among the beginner and intermediate archers thanks to the very reasonable pricing and extremely durable construction and shooting accuracy. I’m sure you’ve heard this name before. They’ve been on the market for an impressive 80 years, and their staff is known for a wonderful fondness of everything Archery-related – they don’t just sell bows; they also love what they sell. Their line of recurves is divided into hunting bows and competition (target) bows. 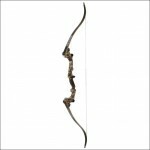 The Buffalo and GameMaster II are a few of their best known recurve bows. Established in 1970 by Pete Shepley and currently located in Tuscon, Arizona, the company specializes in making Compound bows, however they do have a few great offerings in the traditional recurve department as well. One of their most reliable models is the PSE Blackhawk, a 60 inch-long, beautiful bow that is suitable for both hunting and target practice. The $259 price tag makes it accessible to everyone. Perhaps not as popular as the other archery bow manufacturers, but they definitely should not underestimated. Their Samick Sage recurve bow is particularly worth a mention here – it’s a first-pick for many aspiring archers, and not without reason. Founded by Bill Forman and located in Pampa, Texas, The Great Plains Traditional Bow Company is all about recurve bows and other traditional makings. Bill himself was born in a town that was one day owned by the Comanche and the Apache – a fact which definitely had an influence on his love for traditional archery. Bill is known for his intense personal involvement in all company affairs – he never sends representatives to shows and meetings but instead chooses to go himself. It goes without saying that their recurve bows are made with love and complete dedication. This company is perhaps well known for their top-quality custom-made traditional bows. Their customer service is absolutely superb, and you can even “test drive” a certain bow before purchasing it in some cases. All of their bows come with high-quality strings, very durable risers and have what I consider to be some of the most beautiful designs in the world of traditional archery. To give you an idea of how much detail goes into the making of every one of their bows, you should know that it takes up to 10 weeks for your custom-made recurve bow to be ready and delivered. The company was founded by Ron Pittsley and Mike Hoadley in the late 80’s. Their initial focus was on bow replacement parts, but as time went on the company expanded and started making entire traditional bows as well. 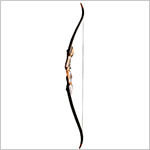 They are most known for high quality take-down recurve bows. This is a great list, but… none of these brands make a reasonably priced recurve, with a legal draw weight for hunting, for short people. 48″ AMO or under, for people 5’0″, between 45-55# @ 28″ draw weight. None of this is to sound disrespectful, but $250+ is expensive. Compound bows are expensive to buy and maintain. Recurves are simple, and can be mass produced now. Why do they cost so much when they’re a piece (or more) of wood? Demand is low and supply is high. They’re not made of precious metal. Please help us vertically challenged people with this issue. Please. Tyler, us tall guys with long natural draws have the same issue. The standard bow is 28inch draw, I pull a 31.5. I’ve had shops try to adjust my anchor point rather then fit the bow properly. Bear makes reasonable priced recurves and longbows. Tyler needs to check out the Kodiak Magnum…. I have a 32″ draw. Would it be advisable too use a Recurve?? I had a Bear Compound bow in HS, but want to start shooting a bow again, but am more drawn to recurves. Thank you. I use a 72″ recurve – made of wood. I tried also a 70″ before but since I have a 32″ draw it was sometimes crucial to shoot with it. After I switched (had to order one at my store the middle part since it isn’t ‘common’ at shops) everything works fine and shooting makes much more fun. At least there are now rumours that a certain – not here listed – firm might publish next year a sport recurve 27″ middle part for about 300-350€ which is a lot cheaper then Hoyt or WNS. I recently purchased a large stock of scrap wood from a bow maker for my own wood projects. Wish I could find him again. Still searching, but he sold me some great exotics from scrap wood. Anyone know where I can get more. Been working with current stock about 3 years. My health now keeps me at home, so needing to restock😊. Thank you.